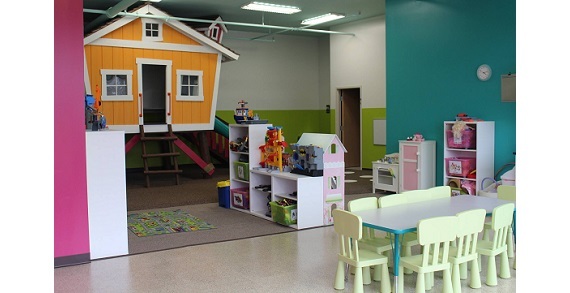 Kiwi’s Clubhouse makes it fun to be a kid and a little easier to be a parent. Kiwi’s Clubhouse is designed to make being a parent just a little easier. No need to sign a contract. No problem if your schedule changes and you only require an hour of childcare one week and forty hours the next week. Kiwi’s Clubhouse is here when you need it. 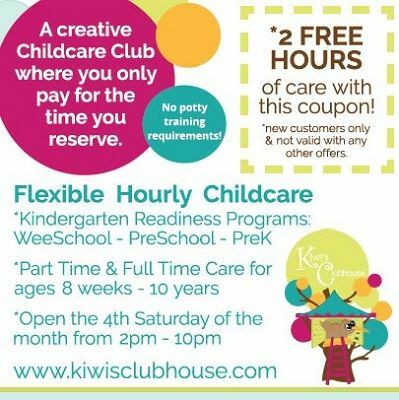 Whether you’re looking for flexible childcare or programs to help your children master the skills they’ll need in school, Kiwi’s Clubhouse is the place to be! Ages 8 weeks up to age 10. There are no potty-training requirements - ever! Pre-K, PreSchool & WeeSchool programs are designed to promote curiosity, creativity and a love of learning! And Kiwi’s Clubhouse is open the 4th Saturday 2pm-10pm, so you can have a date night! Now, there's a thought! See the ad for 2 free hours of care for new customers! Enrolling NOW for Fall Education Programs! Hours: Monday-Friday 7am-7pm; 4th Saturday 2pm-10pm.